NYU’s development plans for remaining portion of the site unaddressed. On November 18, 2008, Landmarks voted to collectively designate University Village, also known as the Silver Towers, as an individual City landmark. Designed by James Freed and I.M. Pei, of Pei Cobb Freed & Partners Architects LLP, the landmark consists of a central plaza and three 30-story towers with concrete facades and recessed windows in a “brutalist” style influenced by le Corbusier. Built between 1964 and 1967 as part of a Robert Moses-sponsored urban renewal plan, the towers are arranged in a pinwheel configuration around the plaza which features a sculptural interpretation of Picasso’s “Portrait of Sylvette.” Two of the towers are used by NYU for student and faculty housing, while the third houses a cooperative. At the June 24, 2008 hearing, representatives of NYU presented a plan to add a fourth tower. While supporting designation, NYU’s agents claimed a fourth tower would complement the existing buildings and “complete the pinwheel.” In response, preservationists called for Landmarks to designate the entire superblock, not just the towers and plaza. 5 CityLand 94 (July 15, 2008). At the designation hearing, the commissioners were generally enthusiastic in their support of landmarking. Commissioner Christopher Moore called the complex a “fascinating part of our very eclectic landscape,” while Commissioner Pablo Vengoechea praised it as an excellent example of how tower-in-the- park developments can be done correctly. Commissioner Roberta Brandes Gratz endorsed designation, but also made a point of stating that the towers’ construction was “a Robert Moses mistake” that replaced a viable manufacturing area. Though Brandes Gratz believed the complex should never have been built, she said that at least the City obtained “something worthwhile” from the destruction of the neighborhood. Chair Robert B. Tierney thanked NYU for being “cooperative partners” in the designation, but did not address the issue of further development on the site. Stating the he was “delighted to be able to finally designate” the towers, Tierney called a vote, which passed unanimously. 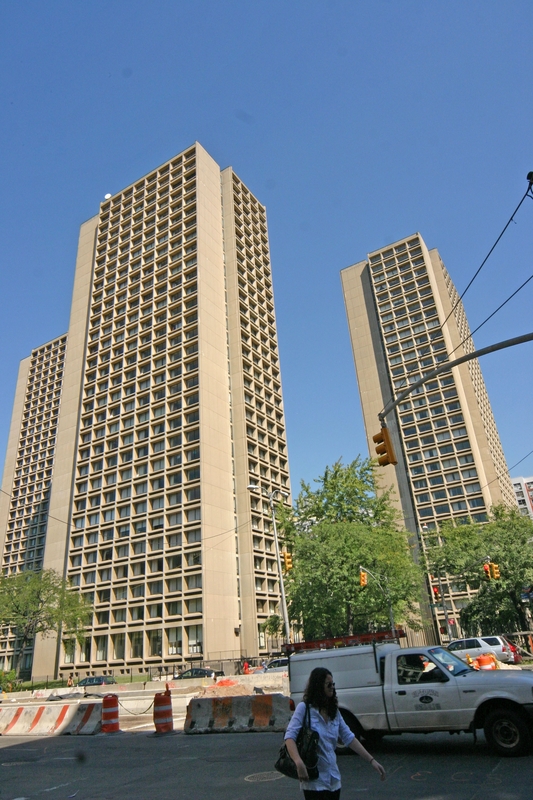 LPC: New York University Silver Towers, 100, 110 Bleecker St., 505 LaGuardia Pl., Manhattan (LP-2300) (Nov. 18, 2008).